2. The Butler Did It: Yes, the game was down to the wire and suddenly the rookie Butler did it, but not in the library with a candle stick. He did it at the 1 yard line with the perfectly inflated football. Butler had the most important play of the season…literally a game changer! He methodically intercepts the ball at the 1 yard line, sealing the deal for the Pats. So yes…this time the Butler did indeed do it. He committed a perfect play executed at the most needed time. And of course, Butler’s stupendous play has its own hash tag too. #ButlerInterception! 3. 24…2 Bad! That moment when Sherman is holding up two fingers followed by four fingers, making the salient point in a very arrogant manner that the Sea Hawks in fact have 24 points and are in the lead. At this moment you can’t help but feel infuriated as though he is rubbing salt directly into the wounds. However, there are no wounds to be salted for the Pats. 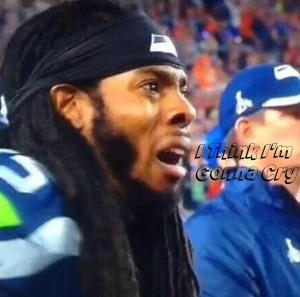 So sorry Sherman that you so boldly assumed your victory and we all know what happens when we assume!